Australian Mathematics Competition: This is a nationwide competition held every August. For the third year in a row, Princess came equal top in Australia. She is great at maths but I must also say that we use ‘Singapore Maths’ for her schooling and it is fabulous at making the student do 2 or 3 step equations to get to the answer. Prophetic Words: David Wagner, a world renowned prophet, was in Melbourne last weekend and Hubby had the opportunity to be on two different ministry teams with him. Once in Daylesford at the Drinkfest run by churches there where some of the Stairway Prophetic team were invited to participate in giving prophetic words to folk. The second time was at the Empowered Pastors Meeting at Stairway where various Pastors from all around Melbourne come and meet and share. Hubby again was invited to give prophetic words which he loves. An added bonus was that at the end of the meeting, David gave hubby and each member of our family a prophetic word. It was so encouraging to hear. The kids love hearing what is said about them. I had been quite remiss in that when hubby was in Queensland at a conference three weeks ago, he received an indepth prophetic word for each family member. We hadn’t made time to sit down and listen to these words so this last week we did that. We also transcribed the words out so that we can read them. When I get a Prophetic word, I love to write it out, read it out aloud every day for a month and pray into it and then change it to declarations and say these out aloud every day for a month. This helps it to solidify in my mind. I then look at what needs to be in place in our life or what changes need to be made for these words to become a reality. An example is when we received prophetic words over our children about them having a healing gift, we joined the Healing Rooms as a family to steward that and grow the children in that gifting. We can’t just expect our children at age 21 to be competent in that gift if they haven’t ‘practiced’ it. I have lost count of the number of times that people have approached me and said how one of my children prayed for them or drew a picture for them about a healing and they were healed. When we say the prophetic words over our children, Matey in particular, you can almost visibly see his spirit become alive. There is a physical reaction in his body when he hears prophetic words about himself. Daylesford: Last week as a family we went to Daylesford where we had been invited as a family to join with a church there and help them pray over some land they are thinking of purchasing and some new ministry opportunities the church was looking at. We had a great time and I was personally excited to see how much Princess and Matey had grown in this whole area. There were 4 different parcels of land and they both received the same as I did in regard to each parcel of land. Princess also sensed in her spirit that there was something negative and bad in one corner of one block. The leader of the church then admitted that a terrible tragedy had occurred on that corner a few years ago, thus Princess’ sensing was accurate. It was a great country drive of two and a half hours each way. Very unusual for us was the fact that we didn’t have any educational tapes playing the whole time. Usually on these trips, the kids love listening to Audio tapes about Explorers and scientists and famous people of history. We didn’t even play ’20 Questions’ which is huge in our family. Instead, we talked as a family the whole time. Reading the Bible: This past week we have commenced reading the Bible out aloud as a family. We are aiming at reading 3 chapters per day so as to finish the whole Bible by Christmas 2015. There are a few reasons for this. Firstly, it is great elocution lessons for the kids to read aloud on a regular basis. With Princess being such a competent reader, one of the downfalls is sometimes her pronunciation is not accurate as she reads so much by herself and not listening to me read to her. Secondly, we want to get more scripture into our family life and just use the Bible as our main devotional aid for a while. Thirdly, I had no idea how much of the Bible I take for granted and how much the kids don’t know. We decided to start with the New Testament first. I am thoroughly enjoying them reading it out aloud and hearing what Jesus said. The other day, they were both horrified to read that Jesus said that you could go to hell if you called your brother a fool. It was amazing the difference it made to their treatment of one another after that. Princess had also wanted to skip the geneology in Matthew 1 because she just saw it as a list of names. Once I explained the significance of this to her and the point about the limited number of females mentioned and why they were mentioned, it made sense to her. Diversity of interests during the week: It never ceases to amaze me how much ground we cover in different subjects when the kids follow their interests. This last week we have researched and looked at movies of Corrie Ten Boon, Alfred Noble who invented dynamite and then set up the Noble Peace Prize, George Washington, and endangered species. This is all out of ‘formal school hours’. Stung Treng Toilet Block Fund: we recently had some folk around for breakfast who are now living in Cambodia. They shared with us about the local school where they lived. It has about 100 students but there are another about 300 students who don’t go to school as they can’t afford the school uniform and books. This couple were sharing how they would love a school here in Australia to partner with this school. If anyone is interested in this, can you please contact me. Thanks. They also shared how the classroom roof has holes all through it so when it rains, everything gets wet. Also, there are huge holes in the floor. Plus, there are no toilets at the school. Our kids of course were horrified as it is hard to imagine a school with no toilet. Thus, we decided as a family to share with one of our homeschooling groups about this and see if they would help us collect the $300 necessary to build a great toilet block for them. We have decorated a toilet roll and put cardboard over the hole at one end. Whenever we finish a toilet roll, we are placing a $1 or $2 coin in the middle of the toilet roll sitting on our bench. We are then seeing how much money we will make in the next 2 months. If you would like to join us in is project, then we would love it. Christmas cards: Our family and the homeschooling group participated in Compassion International’s project for Christmas. They needed people to write Christmas cards to the children who are on their list but don’t yet have sponsors. These will be sent to these children along with a small gift so as to encourage them. 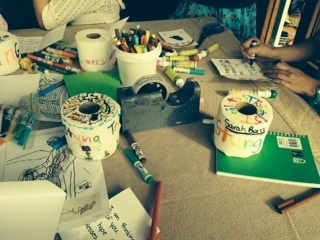 The kids also wrote postcards to Syrian Christians to encourage them. Autism Prayer Morning: At our last Healing Rooms morning, we set up a room especially for children with autism. Our church has many prophetic words over it about seeing children healed from autism. Thus, we have decided to go after this to see the healing. We have been on a journey with several families who come each month to the Healing Rooms and have seen massive improvement in various areas of their children’s development. This room was set up specifically to pray for them and the whole family whilst the children encountered God at various stations around the room. These stations included: a love heart sticker area depicting the fact that we need to experience the love of Jesus. A throne to sit in and directly ask God for your hearts desire for your child. A hammock for the child to feel safe and rocked. Blowing bubbles to encounter God through joy. A parachute to lie in or under to feel the peace and comfort. Felt boards to create funny faces and praying as God realigns their bodies with His hands. It was a powerful morning and looks as though it will be repeated next Healing Rooms as well. If you live in Melbourne and know anyone with a child with autism or a child who is physically or mentally disabled, then please feel free to let them know about this. Scripture Union Training: With hubby up in Daylesford at Drinkfest, I took the children with me to the training day for our beach mission we are going on as a family over the New Year period. The kids actually really enjoyed it. There were only 4 families with children, the rest of the 500+ people being singles or couples. Our kids enjoyed it, especially the afternoon elective session. I felt it was okay to let them choose an elective and go together without me to that elective. I had another elective I wished to go to that would have been boring for them. Both kids chose the games and drama elective and loved acting out a short drama and brainstorming large group games. When I think of times like this, I realise that so much more is ‘caught than taught’. They are quite excited about going to the next training session now. If your and your family would like to do something a bit different this New Year, consider joining a Scripture Union team. They are needing more families to join them. The kids apparently have a great time playing with the other children in the caravan park and inviting them along to the meetings. Parents on the team are hugely valued as they want us to just chat with and have coffee with the other parents in the caravan park. It is usually easier for parents to chat with the parents of the kids who come along than expecting a 20 year old to hold a great conversation with the parents. I love chatting to other parents and drinking coffee so it sounds great to me!! Reading: I recently purchased the ‘Life of Fred’ maths books by Stanley F. Schmidt and the kids are enjoying reading through these books. They teach maths but in a completely different way, mainly through bizarre story telling. The set of books is quite expensive but considering especially how Matey learns so much through auditory means, I decided it was worth the purchase. Princess is enjoying reading through them as well. Reading to the kids: Both kids have enjoyed to us reading to them. We spend a significant amount of time each day reading to Matey and Princess has enjoyed listening in as well. I am reading the ‘Sugar Creek Gang’ by Paul Hutchens and Hubby is reading the ‘Freedom’ series by Lois Walfrid Johnson about the underground railway. I drew the line at re-reading that series out aloud as it is quite intense with the slaves nearly caught each chapter. I thought it was fascinating how Matey, after the first chapter In Book 1 of the ‘Sugar Creek Gang’, commented how the author was an excellent writer. I know he is an excellent author when Princess will patiently sit by and listen. Street Christmas Party: Apart from one year in the last ten years, I have organised and run a Christmas party for the residents in our street. We have at least 60 houses in our court and it is a great way for people to get to know one another. I began this tradition the year we shifted into our court and the first street party was held 6 days before Matey was born. I was amazed that the year I didn’t run it, no one else took it on but everyone seemed to complain that it wasn’t organised!! We have printed off this year’s invitation and the kids, together with some other kids from the street, delivered them personally to all the residents. Christmas seems to be a very busy time, but I encourage you to make time for your neighbours. Be creative. Have fun. We have had some years when it was on a day with a heat wave and I had to adjust it to the following weekend, other times when we have had it earlier or later in the day. We even used to have Santa Claus come and deliver presents to all the kids. This was stopped after two years as one of my children absolutely hated Santa and would scream and we would have to take that child away. Also, Santa wanted to bring his grandchildren to the party and they would have recognised his voice, so we soon decided on other activities for the kids. Books on our bedside we are currently reading: Princess has had an interest in mystery stories this last week so resurrected the following books from her bookcase. “You be the Jury – Courtroom 2″ by Marvin Miller. “You be the Jury – Courtroom 3″ by Marvin Miller. “Puzzles for Young Detectives” by K. Frankenstein. “True Spy Stories” by Terry Deary. ‘Irena Sendler – mother of the children of the holocaust’ by Anna Mieszkowska. It may seem like an awful lot of books for Princess to read in the next two months before mid December when we go interstate for Christmas, but she is a voracious reader. She spends a minimum of an hour a day reading, sometimes 3-4 hours daily. I like to extend her in her reading. She has just finished reading ‘Oliver Twist’ by Charles Dickens. Swimming Squad: Both kids are now in the Kings swimming squad, Princess in bronze level and Matey in the Platypus squad. It is exciting for me as their training times coincide for the first time, thus at the moment it is only 3 separate trips to the pool each week. Hubby has been considerate mainly doing the early morning trip!! Loom Bands: We have decide to give loom band bracelets a rest for awhile as the kids are a bit tired of all the loom banding. This last fortnight we have made another 50 bracelets for a friend who has left today to go to a Children’s Centre in the Philippines for a fortnight. I hope you have had a great fortnight with your kids. Sometimes I stop and look around my house and notice all the mess and get dejected. I have a choice though whilst they are still young – an ultra clean house or quality and quantity time with my kids. Unfortunately it is hard to have both and everything else that we try to fit into our lives. How do you fit everything into your life? What usually misses out?